Been tinkering with some ideas for a female thief. The same model could be used for NPC thief characters and for the female player model (the T2X guys are interested in using TDM for future Zaya missions). Two versions below, with scarf and without. I'm lukewarm about the concept, so feel free to provide suggestions. The mask seems to add a bit more flare and style to her. It needs some fleshing out (olol more clevage), but I like what you have so far. 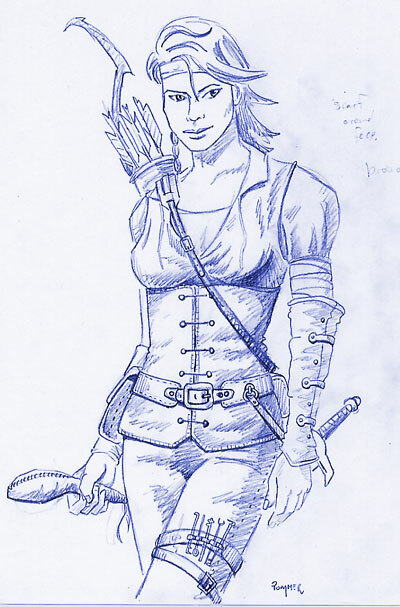 Is thix the politically correct alternate to the male thief main character? It;'s a nice modelable character concept as usual. I'm not sure she'd openly wear a set of lock picks on her thigh though. I'd image she has to get to and from her 'jobs' through the city. I certainly would like to play with her. And yes, the first image looks better. I'm not sure she'd openly wear a set of lock picks on her thigh though. You're right. I thought about that after scanning it. I'll change it to a leather carrying case in the next version. For models, different heads can be used for variety among npc thieves. Wow, that's great Spring! Your female characters are very attractive looking without going Hollywood. Absolutely gorgeous.